I have an inspiration board on Pinterest where I save things that I might like to make or be inspired by some day. Clean white with a splash of color has always been a favorite of mine, and I live in the country. So I knew that inevitably this project would make it to my craft table one day. 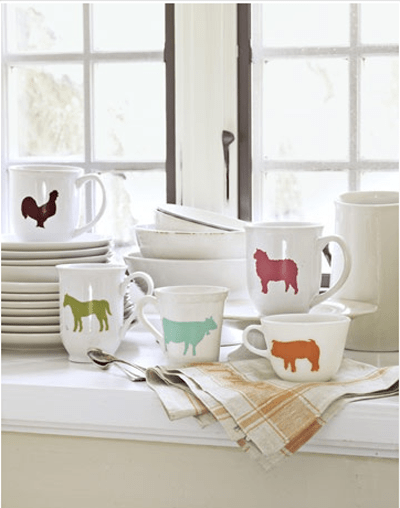 A year after I pinned it I finally sat down to duplicate this fun set of mugs from Country Living. What spurred me to finally get to it? Now, back to the project. First off, Country Living’s instructions are minimalistic at best. 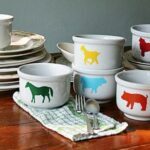 They do offer a few printable patterns, but not every animal in the picture. So I took things into my own hands and used theirs as well as digging up 3 more animals from other sources. I found the horse pattern on DragonArtz Designs. I used the one that resembled Country Living’s and flipped it. 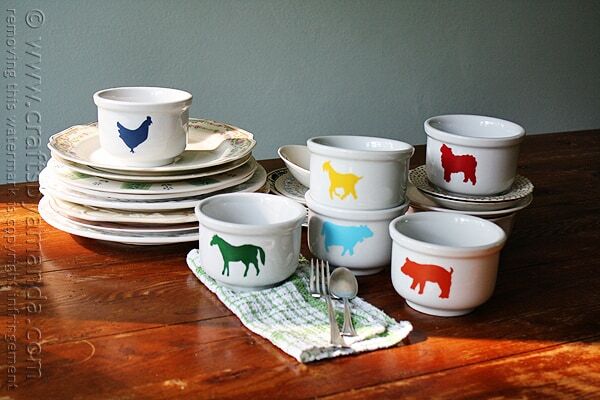 The goat and the chicken (couldn’t find a decent rooster) are actually a font called Farm & Wild Animals. Country Living’s version has 5 animals. I found 6 white bowls at the flea market, so I needed a 6th animal. Hence the goat! I used contact paper Clear Contact Paper to create the stencils. 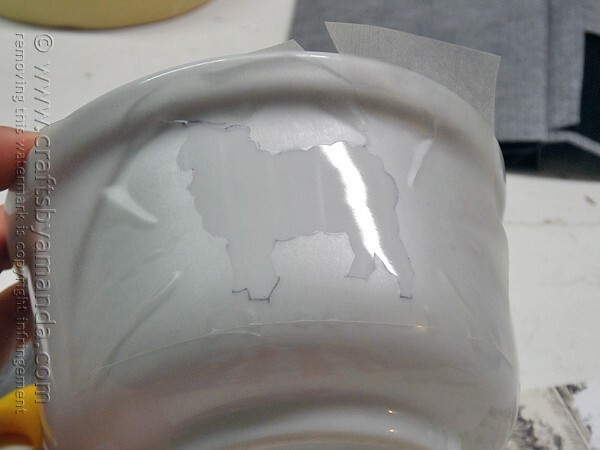 Place your printed animal pattern underneath the contact paper and trace it with a pen. Cut the inner section of the animal out. 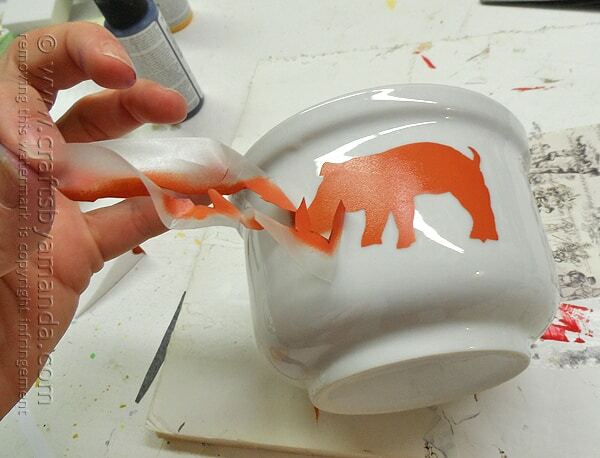 Position your stencil onto the bowl, making sure its centered, and push out any air bubbles, especially around the stencil edges. Buy cosmetic sponges (like these from Amazon) or grab some at the dollar store, and use them for all of your stenciling projects. I promise you will go from a stencil hater to a stencil lover. I absolutely did! They have made all the difference in the world. 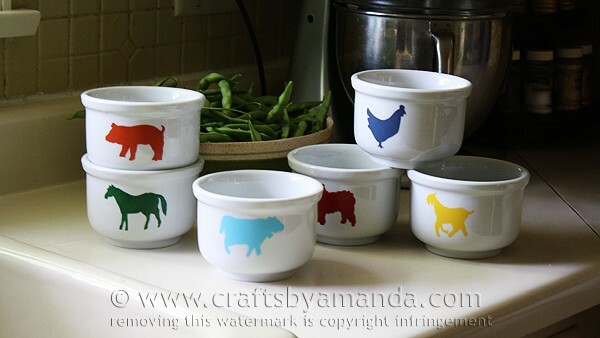 I’ve tried all different sorts of stenciling tools, and by far these are my favorite. I won’t use anything else from here on out. I learned this tip from my uber creative friend Donna, who also happens to be DecoArt’s Design Department Manager. Her head is so full of great ideas I’m afraid she might burst some day! I use mini paper plates, squeezing some paint out on one, dipping the sponge into the paint and dabbing it off a little. Then I use the second plate to dab off the remaining excess paint. With a straight up and down motion (which of course I’m not demonstrating here :-P) apply a thin layer (almost dry) over the stencil. Take a 1 minute break. Now add another layer to darken it up a bit. Peel off the contact paper and set the bowl aside to dry. Repeat this process with all of your bowls (or mugs, plates, what have you). Hand washing is best, but these paints, if cured as directed above, and dishwasher safe on the top rack. Everyone loves saving money, right? 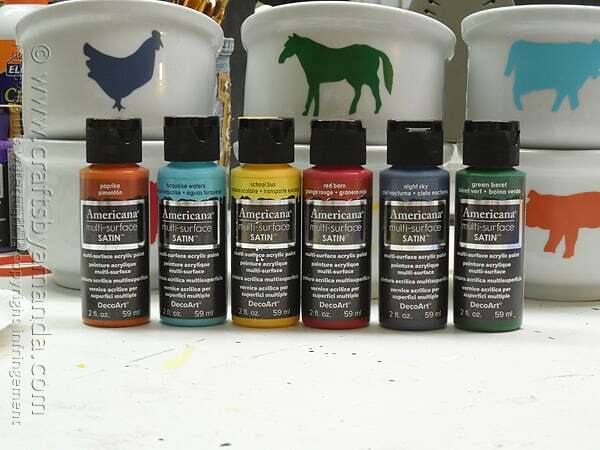 I encourage you to try these multi-surface paints. They have a nice, smooth finish and are great for so many projects! 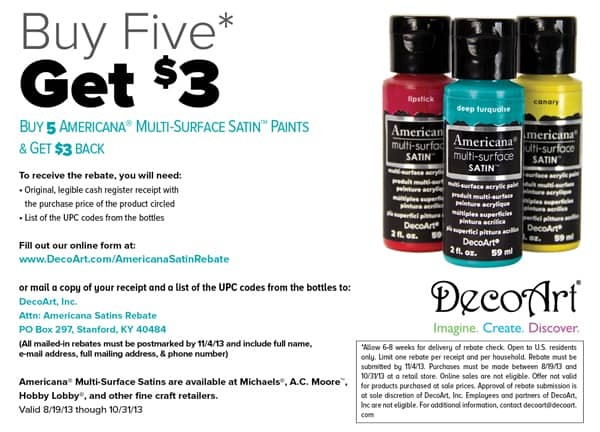 Check out the rebate below! Print the pattern(s). 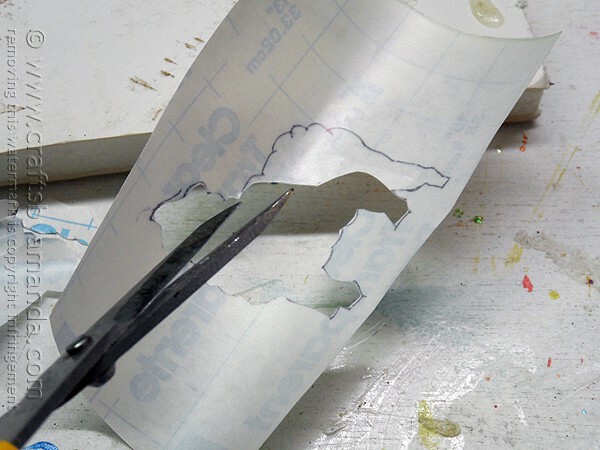 Place your printed animal pattern underneath the contact paper and trace it with a pen. Cut the inner section of the animal out. 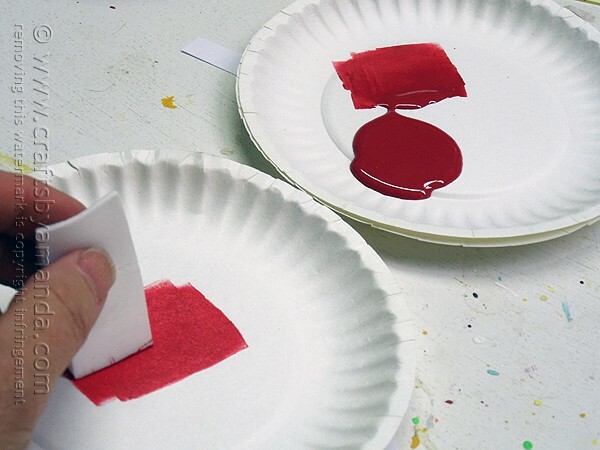 Use 2 mini paper plates, squeezing some paint out on one, dipping the sponge into the paint and dabbing it off a little. 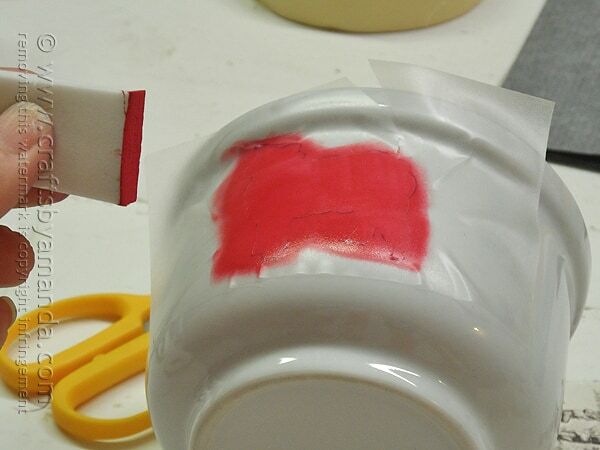 Use the second plate to dab off the remaining excess paint. With a straight up and down motion to apply a thin layer (almost dry) over the stencil. Take a 1 minute break. Now add another layer to darken it up a bit. 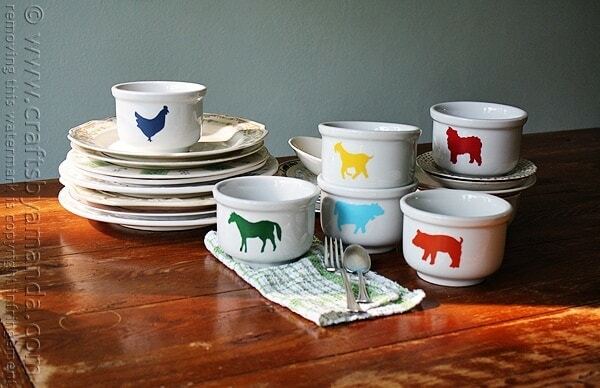 Oh I love your bowls, very cool!! I love these! I pinned them on a future board to do as well and now you have made it easy for me, thanks!